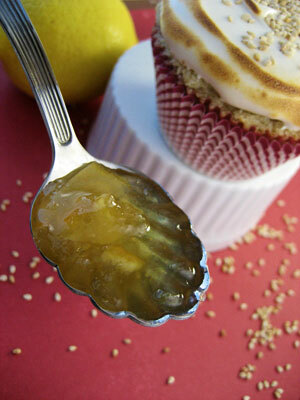 This burst of frugality was inspired by the theme ingredient: honey. I really love honey meringue frosting and since it would give me an opportunity to use up some extra egg whites, I figured I’d see how far I could take the concept of using only things I already had. I thought about some things that go well with honey that I also happened to have. Lots of teas and flowers, obviously, but I wanted something different. Something special. Something that was just languishing in my kitchen cabinet. It looks kind of fanciful. A lone jar of tahini was my answer. Sesame and honey are awesome together! I boosted the intensely nutty sesame cake experience with a crunchy chewiness via some of the toasted sesame seeds that I always keep around. A little monochromatic but look at that crumb! 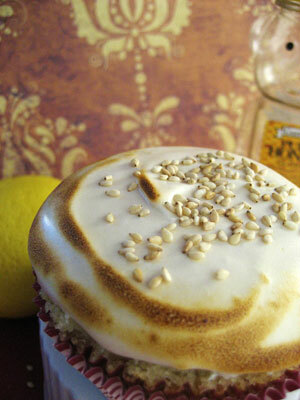 Since the meringue frosting is so insanely sticky-sweet, I figured I’d tone it down by torching it a bit, but I wanted something else to cut through both the sweetness of the honey and the tender fatty richness of the cake itself. I decided to go with a nice sour lemon marmalade, with a little honey cooked into it to give it a nice floral note and tie the flavors together a bit. I think it does the trick quite nicely – though lemons were the only thing I didn’t have. Luckily they can be had cheaply in the store downstairs from my apartment, so it didn’t really matter. Anyway, these cupcake are pretty crazy. 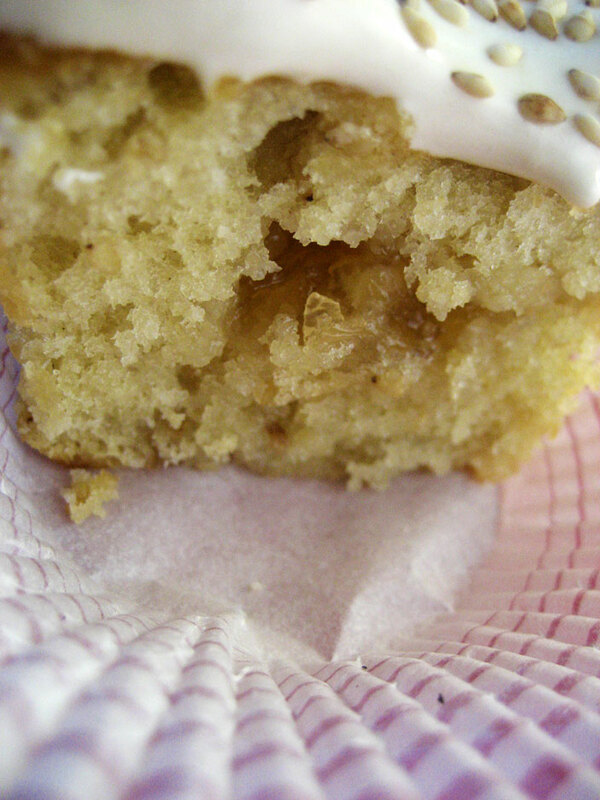 The frosting is so light and billowy yet marshmallow-like in stickiness, and it completely collapses when you take a bite. The cake is just as insubstantial, due in part to the extreme fattiness of sesame seeds (also this recipe just makes crazy soft and tender nut or seed butter cake). This is why the directions call for repeatedly freezing the cupcakes during the decorating process. Altogether they’re a bit exotic and unusual, but definitely tasty. Don’t skip the torching step – even if you have to do it with a Bic lighter the toastedness is essential. Thoroughly wash the lemon. On a plate with a substantial rim (so you don’t lose any juice), use a sharp knife to slice the lemon very thinly, reserving the seeds. Chop the slices up further until you have very small pieces of outer skin attached to the flesh. Dump the lemon and juice into a small saucepan and cover with the water. Tie the seeds into a cheesecloth pouch and add to the pan. Bring to a simmer and cover, cooking gently until the rind is soft. Remove from heat and stir in the sugar and honey until the sugar is dissolved. Return to heat and bring to a boil. Reduce the heat and cook on a low boil for about ten minutes, testing on chilled white plates to see if it’s set. Once it is, remove from heat and squeeze all the pectin you can out of the cheesecloth bag. Allow to cool fully before attempting to use. Preheat the oven to 350F. Cream the butter and sugar until light and fluffy. Add the egg and vanilla, scraping down the bowl and making sure it is fully emulsified into the creamed mixture. Sift together the flour, baking soda and salt. Add it to the batter alternately with the buttermilk and hot water, scraping down the bowl often. Add the tahini and sesame seeds and beat on medium-high for a couple of minutes, until light and fluffy. Spoon into a lined muffin tin and bake 15-20 minutes, until a toothpick inserted in the center of one comes out clean. Allow to cool fully before assembling. Place the honey in a small saucepan and bring to a boil. In the meantime, whip the egg whites and salt to medium-stiff but not dry peaks. Reduce the whipping speed to medium and pour in the boiling honey in one continuous stream. Return the speed to high and whip until stiff, glossy peaks form and the meringue is about room temperature or a little warmer. Freeze the cupcakes solid and trim any excess cake overhang with kitchen shears. Using a small circle cutter, cut the center out of each cupcake, reserving the plugs of cake and trimming them down to 1/4″ thick lids. Fill each cupcake with marmalade and top with lids. Freeze again until solid. Using a small spatula or a butter knife, spread the frosting on the cupcakes, leaving the sides thick and the top fairly flat. 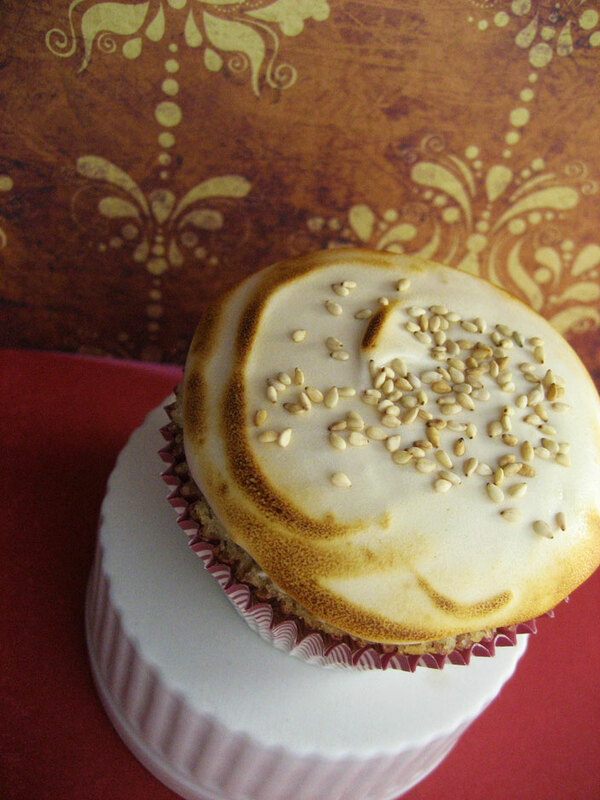 Using a kitchen torch or just a high powered gas burner, brulee the outer edge of the frosting on each cupcake, then sprinkle more toasted sesame seeds in the middle. Makes 12. 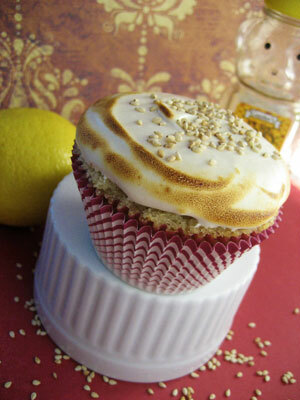 Hooray for frugal cupcakes! They sound delish. Alas, I am tahini-less right now. They’d prolly be yum w/some natural pb, too. Hope all is well! 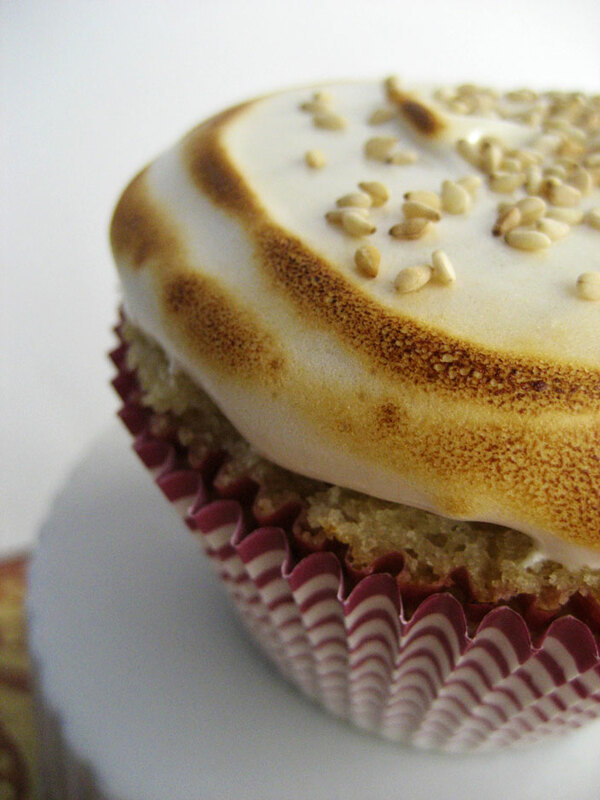 The textures in this cupcake make me super excited about this recipe. Very unique, very tasty!